Faraday the Blob » Archive » 111. Gorra Light, Bud? This entry was posted on Friday, September 24th, 2010 at 7:00 am and is filed under Comics. You can follow any responses to this entry through the RSS 2.0 feed. You can skip to the end and leave a response. Pinging is currently not allowed. heh heh “bethar”.. does the Ireland soccer jersey on fathead skanger have NAMA as the sponser?.. luv the heroin chic look of the dude in black t shirt and the Nama reference on the udders jersey.Beware John quiff Delaney will doubtless claim credit for the latter deal. Thanks for the comments, buds. @Keoghbot/pappamick – well spotted! NAMA seemed like an appropriate sponsor for dear little ireland at the moment. Dan – Ha ha, no, it’s not Mr. Walkenstown I’m afraid – might put him in a later strip though… bud. Helen – Hmm… No other reason than I forget sometimes! Most excellent, as always! 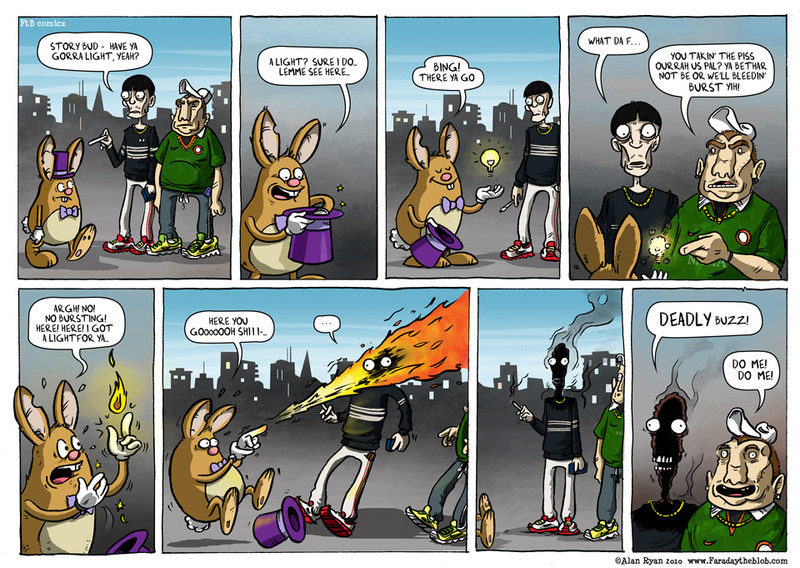 Love the second to last panel, he totally looks like a burnt out match stick, nice!